Eating Joints are common hangouts for students in educational institutions. Manav Rachna campus has many Cafeteria and Canteens to cater to varied taste of students, which provide various food items in a hygienic environment. The Campus offers a varied and excellent choice of places to eat. The eating joints offer excellent multi-cuisine menus ranging from Indian to Continental and Chinese in a comfortable and vibrant ambience. One can find enormous range of recipes from pizzas, rolls, Chinese, Continental, and all kinds of Indian cuisines as well as varied range of sandwiches, snacks, fresh fruits, cakes etc. Wide variety of fresh juices, cold coffee, milk shakes, and other beverages are also available. Latest addition to MRIU campus, Hot Embers serves tasty and sumptuous Soups & Starters, Grills (Fish, Chicken, Cheese, Anjeer), Curry Corner serving Non-Veg/Veg Thai dishes, Noodles Corner serving Maggie & Pastas and Soft drinks, Tea/Coffee etc. 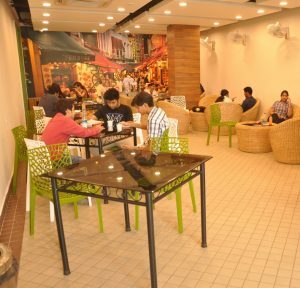 Hot Embers Student Café (Central Library, T Block): Serves snacks, soft drinks, Tea/Coffee etc. 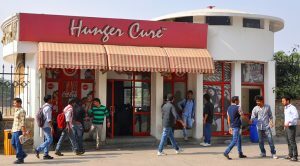 This café serves Footlong, Pastas, Salads, Garlic Bread, Chili Mushrooms/Gobhi and other snacks, soft drinks, Tea/Coffee, Shakes etc. Stationery shop (Q Block): Stationery, Photocopy, Snacks, Soft Drinks, Tea/Coffee etc.